At the History Colorado Center, we want all of our visitors to feel welcome. Here’s how we try to be accessible for everyone. If you have additional questions you can email us or call 303/447-8679. Parking is available in the Cultural Complex Garage and at meters on neighboring streets. A person with a valid disability placard or plate may park where there is metered parking without paying, for up to 4 hours or the amount of time on the meter whichever is greater. 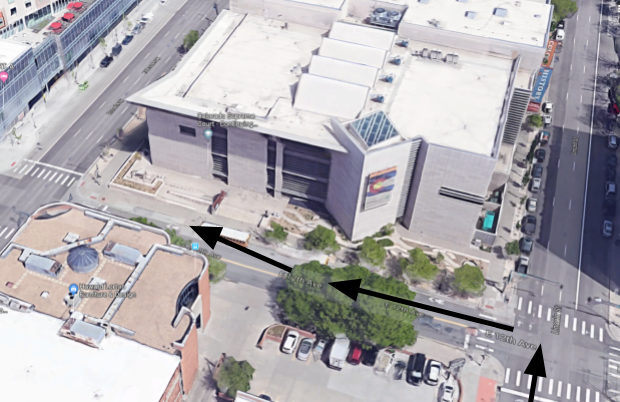 If you need, we also have a loading dock on 12th Avenue between Lincoln and Broadway (see image at left) with a ramp that leads to the main entrance. Barrier-free doors with push-button entry are located at the museum’s main entrance on Broadway. Elevators are located on the north side of the building. You may check out a wheelchair at the Admissions desk; they are available on a first-come first-served basis. An ID is required. Wheelchair size is standard with a 250 lb. weight capacity. There are restrooms throughout the museum, and all are wheelchair accessible. We have family restrooms at the northeast corner of the first, second, and fourth floors. We have a nursing room in the northeast corner of the third floor; please inquire at the Admissions desk. Service animals—animals that are individually trained to do work or perform tasks for the benefit of an individual with a disability—are allowed throughout the museum. We offer closed captioning in all of our exhibits! For guests on the autism spectrum, we offer Low Sensory Mornings four times a year. Click here to learn about our Low-Sensory Mornings. You can also download a social story here. Groups with disabilities/special needs cost $6 per participant. Caregivers and staff are free. Find out more about group rates here. To make a reservation or get more information, please email reservations@state.co.us or call 303-866-2394. Get answers to more FAQs here.